Oracle's Java infringement case against Google's Android is reportedly nearing a reversal of last year's original finding that defended Android. Meanwhile, Google is focusing new attention on Chrome web apps rather than a continuation of Android's original "embrace and extend" Java strategy. 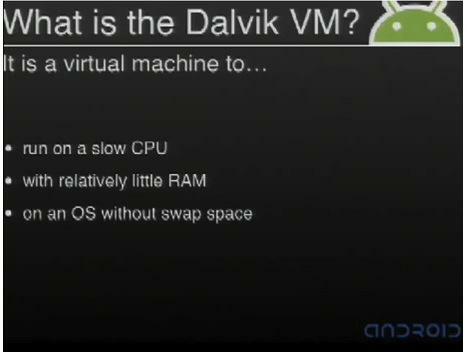 Two moves announced today cast new doubt on the future of the current state of Android as a Java-like platform for running Dalvik virtual machine middleware on mobile devices with limited resources, the company's original strategy for Android (above). The first comes from the United States Court of Appeals for the Federal Circuit. Florian Mueller of FOSS Patents drew early attention to two reports indicating that the court will likely reverse last year's ruling by District Judge William Alsup. That decision had stated that Google's copying of Oracle's Java API code for use in Android wasn't an infringement of Oracle's rights because the appropriated code wasn't protected by copyright. With a reversal, Oracle can sue for damages and seek to force Google to make Android compatible with Java. Back in the early 1980s, Apple similarly sued copycat vendor Franklin for cloning its Apple II code. It initially lost before the ruling was overturned by an appeals court that found Apple's code was worthy of copyright in a landmark case that shifted the industry. If last year's ruling in Google's favor is indeed overturned, there may still be an opportunity for Google to argue that its use of Oracle's Java code was permitted as fair use. In any case, losing the appeal would greatly complicate Google's future plans for Android. With the Java-like architecture of Android's app platform under renewed scrutiny, Google moved to steal headlines with the announcement today that the former leader of Android, Andy Rubin, is now working on robots, a media distraction on the order of Amazon's "Prime Air" stunt for Cyber Monday. Additionally, a report by Emil Protalinski of The Next Web states that Google is working to bring Chrome web apps to Android and iOS devices as early as next month. Google has succeeded in promoting the widespread adoption of Android at the expense of Oracle's own Java (which was similarly on more than 80 percent of phones prior to Android). However, despite replacing the fragmented mess of various Java Mobile implementations with the monoculture of Google's own Dalvik VM, Android hasn't created a rich, successful ecosystem for mobile apps comparable to Apple's iOS App Store. Shifting away from Android's Dalvik and toward Chrome would allow Google the opportunity to reassert control over the mobile app platform, not just on devices that shipped with Android, but also the other, more valuable half of the mobile market that's using iOS, a market segment that dominates education, the enterprise and affluent users who make purchases. Additionally, by focusing app development on web apps via Chrome, Google can also move away from Android as a development platform, distancing itself from the core of Oracle's complaint. Google has also made no secret of Cordova, its plan to host Chrome web apps on Android, a strategy outlined by Mobile Chrome Apps software engineer Michal Mocny this summer (below). Apple already supports web apps on iOS, allowing developers to wrap a generic, standards based mobile web app to appear and behave similarly to a native iOS app written in Objective-C to Apple's proprietary Cocoa Touch development platform. Last year, Facebook chief executive Mark Zuckerberg said "we've had a bunch of missteps" in deploying mobile Facebook apps, and that "the biggest mistake we made as a company was betting too much on HTML5 instead of native [platforms]." He added "Native [platform development] is going to be the approach that we go with for iOS and Android" and that "We're betting completely on it." Apart from Android's Dalvik, Google lacks a substantial native platform code strategy, greatly preferring to use the web as the front end for its popular services ranging from Gmail to Google Docs. In contrast, Apple prefers native apps on iOS and OS X, having only recently created a web version of its iWork suite, and directing any iOS users who seek to access iCloud via the web to use Apple's native iOS apps instead. Google's move to focus on Chrome was easy to predict after the company replaced Rubin as the head of Android with Sundar Pichai, who had previously worked on Google's Chrome browser and led Chrome OS development. The move to 64-bit processors in future mobile devices would also be much easier with Chrome, enabling Google to transition just the Android brand to new hardware without having to invest further in Android's defining Dalvik architecture in order to bring it into compliance with Oracle's Java standards.